I paired Deborah Lippmann – Blue Orchid and Tiptoe Through the Tulips from last years (2014) Spring collection. 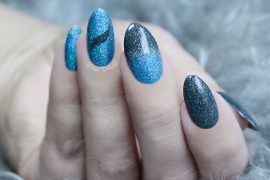 They are both beautiful pastels, with a perfect formula (two coats and it’s completely opaque) that smooths itself out on the nail. They are both amazing, but Blue Orchid really blew my mind. This is the perfect sky/baby blue. It’s not to bright, not too dusty. Not turquoise, and not too purple or grey, just… PERFECT! I was amazed of the formula and that even though it’s such a light and delicate pastel, it was completely opaque in just two thin coats. YOU NEED THIS POLISH! This is a gorgeous pastel peach that leans more towards orange than yellow. It’s really pretty and I liked it with my skin tone. I really like this combination, and I might do something more with them, but I’m away this Easter so I’ll see if I have the time. If you’re based in Norway here is a list of the places you can purchase Deborah Lippmann nail polish. *Items in this post were sent to me for free by the company or their PR firm in exchange for my honest review. Both colors are absolutely perfect for Easter! Spring is written all over your nails!